Tonight we are heading to an outdoor concert under the stars. 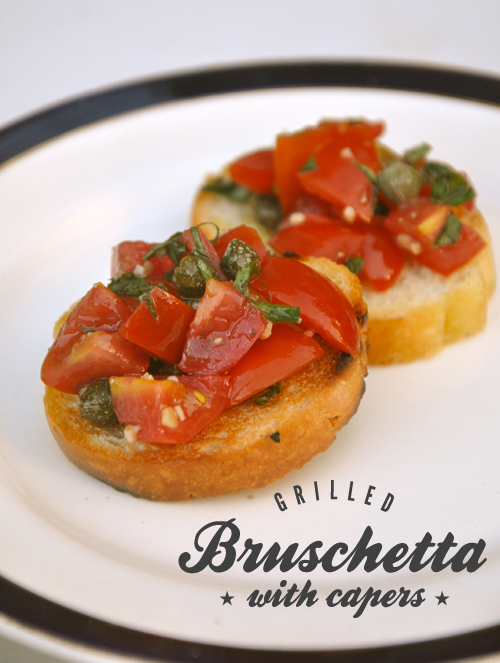 My mom is out of town and my dad is in bachelor mode - he loves tomatoes so it seems like the perfect night for my Bruschetta with Capers. This is a super simple recipe but, oh so good. Just be sure to make it well in advance as you want to give the flavors time to marry. The longer it sits, the better it tastes! In a small skillet, heat the oil over medium heat. Add the garlic and stir for about a minute, emove it right when it begins to turn golden. Pour the garlic & oil into a mixing bowl and allow to cool. While the garlic & oil cool, quarter your grape tomatoes, then add them to the oil mixture along with chopped basil and balsamic. Sprinkle with salt and pepper. Toss to mix and then taste. Add more salt if needed. Cover and refrigerated for an hour or more. Cut baguette into 1/2 inch diagonal slices. Brush or spray olive oil on both sides of each piece of bread, then grill the bread in either a skillet of on the outdoor grill (my preferred method). To serve, give the tomato mixture a final stir and then spoon generously over the slices of bread.